What do you get when you take sweet things, cover them in melted sweet things and then roll them around in powdered sweet things? 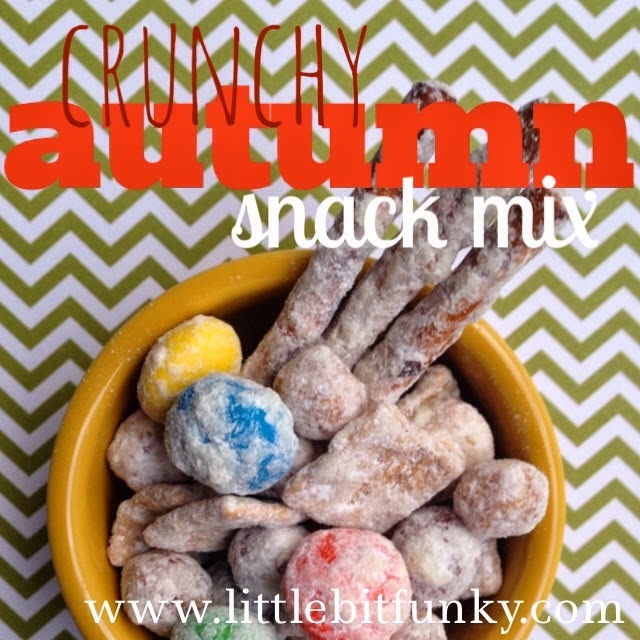 You get "crunchy autumn snack mix". There are precisely 1,000,000 versions of this recipe out there. Why? Because it is so easy to adapt to what you love and want to add in! Here is how I made my particular blend. You can sub as you see fit for the perfect YOU snack mix. Mix the first five ingredients together in a large bowl. In a microwave safe bowl melt your chips. I microwave for 30 seconds, stir, micro for 30, stir, micro for 20, etc, until melted. Or you could use a double boiler. Once the chocolate is melted pour over cereal mix. Stir until coated. Sprinkle with powdered sugar, toss until coated! Your mix is ready to share! !